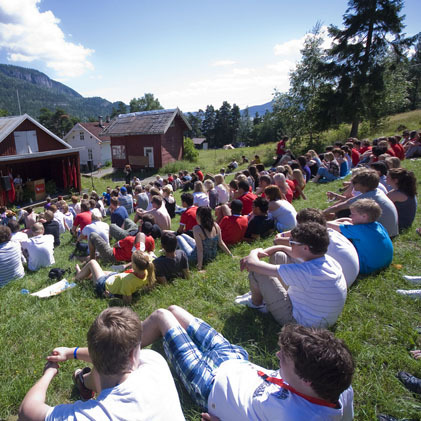 This photo is from the Norwegian AUF (Labour Youth League)'s page about the Utøya summer camp, which makes very painful reading today. You can sign an online book of condolence and solidarity here. Please do. Signed and shared on my FB page. The link is. being shared like mad, on my page. By people who will share it further on. Good work, Ken. If you hear of any support fund, from AUF or wherever, do let me know. One fan here had the idea and mentioned it to me. I should have had it myself. Belatedly, George - very good work! Anon - To be frivolous for a moment: count yourself lucky you hadn't just finished reading The Execution Channel. To be not frivolous: Hope not Hate already has over 9000 signatures on their online condolence book and is hoping to get to 10000 this weekend, so spread the word. Good to hear that, Ken. Here is a link to the Youth Division of the Swedish Social Democratic Party. It links to a page with a bank account number towards the bottom. It's for donating to repairing the damage done to the island where the killings took place; http://www.ssu.se/201107282377/nyheter/ssu/ssu-organiserar-insamling-for-utoyas-ateruppbyggnad . I donated directly, since I live in Sweden. If necessary, this page contains addresses. Excuse my not knowing how to get it in clickable form. Help or info needed? I am grg.bergerATgmailDOTcom. Here is a reply to my email to Norway's AUF (Workers' Youth Association) describing how one can contribute directly. I omitted its first few sentences.